UNITED NATIONS, June 28 -- It was a month late when the UN Budget Committee ended its work on Friday afternoon. As UN Peacekeeping budgets were voted on, Peacekeeping chief Herve Ladsous was not there, though Department of Field Support head Ameerah Haq was. Haq said that since the budget estimates were submitted last December, demands grew for peacekeeping in Mali (which will include a listed child soldier recruiter), for an Intervention Brigade in the Congo (in advance of which the DRC Sanctions report was against predictably leaked) and for UNDOF in Syria. An evaluation unit that Ladsous had proposed was re-named “Strategic Partnerships.” Of all the peacekeeping missions, only the one in Lebanon drew a recorded vote, with only Israel, Canada and the US voting no, on a reference to previous Israeli damage to the mission. From a photo booth above the interim General Assembly floor, Inner City Press tweeted out the vote results. There were farewells to Fifth Committee members now returning to their countries -- from a Westerner, to Belgium, Ireland and the UK -- and to the Committee's chairperson for the year, Miguel Berger of Germany. India's Majeev Singh Puri offered fulsome praise: this is what the UN can accomplish when it get down to work. But journalistic work is being hindered. 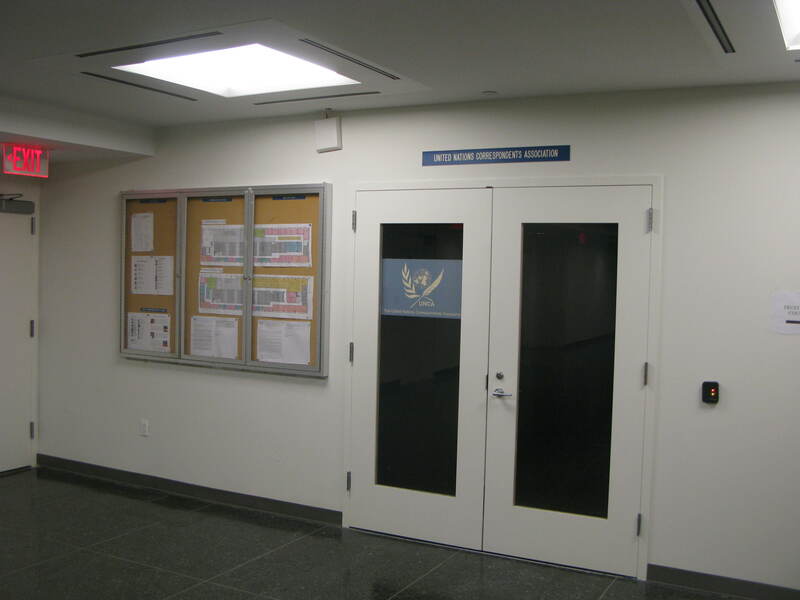 Back on June 10, the new Free UN Coalition for Access complained to the UN Department of Public Information that the media was not allowed anywhere but the photo booths above the floor, where there were no tables to work on, and no translation. DPI replied, falsely, that this was as much as access as existed before -- ignoring the fourth floor balcony from which the press and public could watch the GA -- and said “we will look into the issue of furniture” in the photo booth -- that is, any furniture to work on. But 18 days later, when the General Assembly voted on billions of dollars in peacekeeping budgets, there was no one from DPI there to even let the press up to the photo booths. @FUNCA_info reached out twice on Friday to UN Media Liaison. 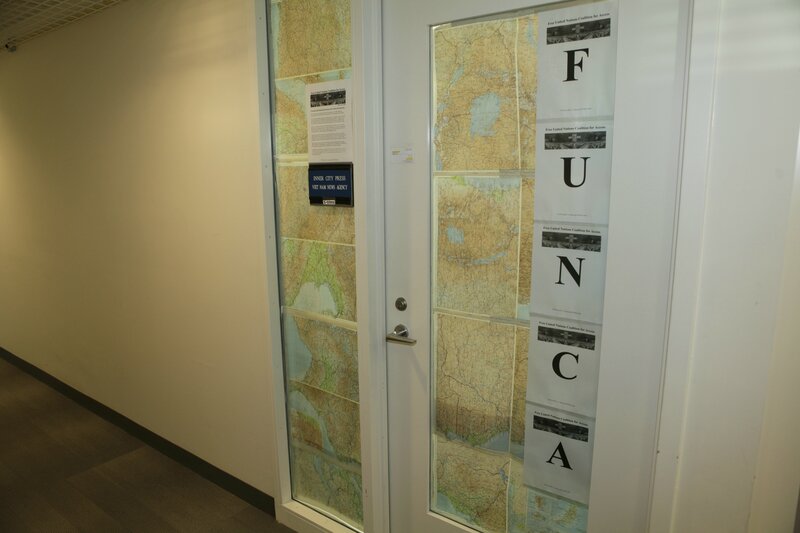 FUNCA has embraced virtual communication, particularly given DPI's repeated attempt to crack down even on a single FUNCA sign, while its favored and largely invisible UNCA has two signs, and a big meeting room that is locked (more on that soon). But there was no response from the Media Accreditation and Liaison Unit. Inner City Press was assisted by another up to the photo booth, and attempted to cover the GA meeting. But when Syria spoke after the UNIFIL vote in Arabic - there was no translation headset in the booth. UNCA is dead or dying, fine -- but what is DPI doing? Watch this site.